Q: What are some important things to ask a home security company? A: There's no shortage of options, but finding the right home security company means knowing your security needs, how much you can afford to spend and understanding a security company's contract. First, you'll need to decide whether you want to work with a national home security company or a local business. One advantage to hiring a local company is you'll be more familiar with the business, its technicians and the way they work. 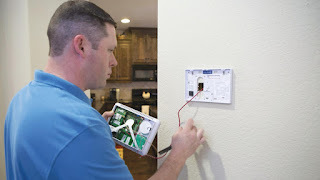 That kind of familiarity is vital if your alarm system activates and you need to speak with someone during a very tense part of the day or night. Make sure to ask prospective home security companies how they charge for different products and services. Some companies offer free equipment or low installation fees, but paying little or no money upfront sometimes means paying more for monitoring later. Monitoring typically costs $25 to $50 per month, but some companies charge $100 or more. Be sure to ask about their monitoring fees and included security features. You might be able to cut costs by purchasing the equipment for your alarm system. Leasing home security equipment for three or four years could mean paying $3,000 or $4,000 for $1,200 worth of equipment. You should also ask security companies about their short- and long-term contracts. If you're not planning on moving anytime soon, a long-term contract isn't necessarily a problem. But if you're unsure how long you'll stay in your current home or whether you even want a home security system, you might want to avoid signing a long-term contract. Ask for help choosing security features that best fit for your home and family. If you have a lot of expensive valuables at home it might be worth investing in cameras, motion detectors and window sensors. But if you have pets that wander free during the day or kids who are home alone, they could trigger false alarms, which can cost you. Municipalities across the country have ordinances charging residents for false alarms. Fines usually start around $25 and increase with each false alarm. Be sure to check local regulations regarding false alarm fines, and ask security companies what they do to minimize false alarms. It's important to interview several contractors before making a hiring decision. Reputable companies should have no problem sending a technician to your house to assess your needs, and honest technicians shouldn't try to pressure you into a sale. Article originally published by Duluth News Tribune on February 20, 2016. I was mentally disturbed because some of my personal dispute issues then I consulted First Security Alarm And Patrol on the internet and all my problems were vanished thanks to them for facilitating me out!